It Came From Celluloid: So Where Were the Spiders? Hello. Guest poster Mikhail here with what could be a new column on Bava Tuesdays, “It Came From Celluloid,” where I’ll bring to your attention a connection between a movie or two and some manner of pop cultural artifact. For example, I might say a few words about Jim’s Sunday best, which consists entirely of the leather costumes seen in Bava’s Planet of the Vampires that Jim purchased at a Cinecitta tag sale. Ok, enough. Here goes number one. In a few moments, the prostitute on the right will fall victim to a camera bug serial killer with a tricked out Super 8. That’s him moving towards the center of the frame. 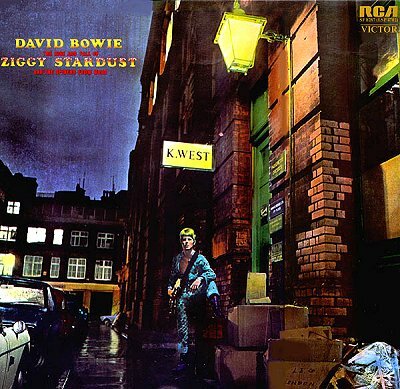 Now here’s the cover image of David Bowie’s 1972 glam rock masterpiece, “The Rise and Fall of Ziggy Stardust and the Spiders from Mars.” In a few moments, the androgynous rocker in the lower center will begin making love with his ego. The credits roll. An eye blinks on the screen and the first scene is unveiled. It is … the cover of The Rise and Fall of Ziggy Stardust and The Spiders From Mars. 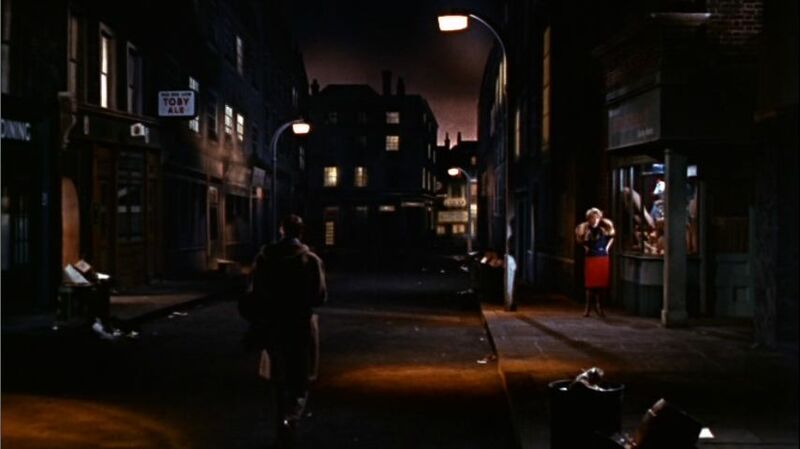 The film’s protagonist, Mark Lewis, approaches a prostitute, who is standing by a wall in a dimly lit street. Boxed debris fills the foreground, right-side. Up ahead, sandwiched between and above the darkened buildings, is the night sky. So the film has another fan, albeit one who, to my knowledge, has never declared his interest. . .
Ok, so what? Maybe David Bowie intentionally quoted Powell, maybe he didn’t. Let’s say he did. Does this further suggest that David Bowie is the coolest vertebrate on the planet or does it lend a bit more cool to a somewhat obscure film? Both? Thanks, Jim, for inviting me to guest post. This entry was posted in movies, music and tagged david bowie, film, general, michael powell, music, peeping tom. Bookmark the permalink. 2 Responses to It Came From Celluloid: So Where Were the Spiders? Welcome aboard hot shot, looks like bavatuesdays is in for some big posts – expectations run high!